My cookie baking history started with these peanut cookies. Back then I had months to spare before the start to my Uni years, so I got the chance to explore the baking world a little. Peanut cookies topped my to-try list then simply because of the two huge peanut fans I had always had at home - my parents. Apart from the hike in electricity bill over the months that I suddenly got so into baking, dad (my biggest fan then) obviously had no complains with the little enthusiasm kicking in me, despite it being a short-lived one lol. He was the first to peek into the kitchen and check on me (or rather the menu for the day to be exact lol) while I was busy whisking, mixing and baking away. Needless to say he was always the first to have a try at my baked stuff as soon as they were out and ready. Since then I had had a couple more experiences with the peanut cookies. Each time was itself an experiment with different recipes that I could get hold of - my aunt's, the cookbook's and others online. 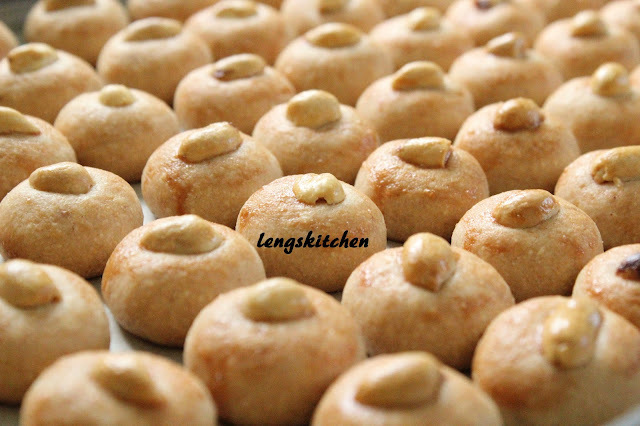 I had been the good baker - making these from scratch, sweating over roasting and especially skinning the raw peanuts; I had also been the mediocre baker where I started my production line straight with a batch of readily roasted peanuts lol. You probably will have to try both versions to taste for yourself if they really do differ and especially if the extra time and effort needed to make them from scratch is indeed justified. I personally do think that there's always a little extra and something great with those made from scratch that somehow are missing from those readily roasted ones. But having said that, oh yes I would do it the easy way still at times. Well this is exactly one of the times lol. Honestly I wasn't that keen with airing them in the yard in this freezing cold weather. But if you have got enough time and patience (and a good weather lol) to spare for the day, by all means do try it the good baker way. It will be a really rewarding experience! If you are using the readily roasted peanuts, get those unsalted ones and be sure that you get hold of a real good and fresh batch of roasted peanuts to begin with. And if you are making them from scratch, this is how I had done mine in the past. Dry fry the peanuts in a wok over a medium heat. Keep the stir frying motion going to make sure that the peanuts have a fair chance to get in contact with the hot wok at all time. The cue to stop is when the fragrance of the peanuts is apparent and the skins start turning dark (some a little burnt and some with the skins start flaking off naturally even) revealing nuts with a darker hue within. Transfer the nuts into a large colander. You can use the huge round plastic food cover - the "tudung saji" (my favorite lol). That always gives me the best surface area to work with. Plus the holes are big enough for the removed skins to pass through easily retaining just the nuts. Move outdoor. We need a little wind here (and some fresh air for you too lol). To get the skins off, you will need some rubbing in between the peanuts. But with them still hot from the wok, press and rub them against the colander with a spatula. You can switch to working with hands once they have cooled down enough. With the skins so dry and flaky from the dry frying, they should come out rather easily. Shake and toss them high every now and then to allow the wind to blow off any skins removed. And to remove those skins nested at the bottom - pour the peanuts carefully and slowly into another huge colander from a distance high up while the wind works its way in blowing the skins away. Repeat until you have most of the skins off. This recipe is one adapted from the recipe by Wendy at Table For 2....or More. Wendy noted in her post that the relatively large amount of sugar in her recipe is essential in binding the dough together well. But knowing well the sweet tooth I have in me and how it can only tolerate that limited amount of sugar, I had chosen to lessen the amount of sugar used still. In turn, I added a bit more oil to get the dough to the right texture. Halving her recipe, I made about 155 pieces of cookies in total. 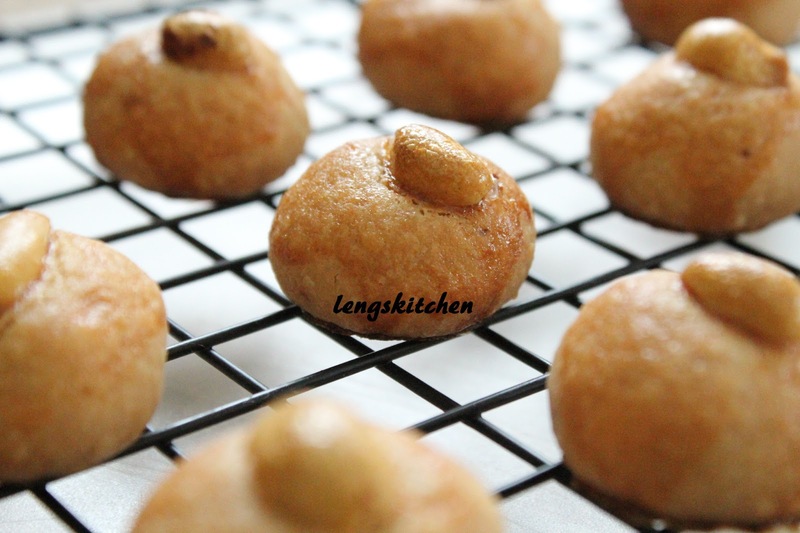 Not only do these peanut cookies taste so peanuty and smell all so fragrant, they actually melt in your mouth! 1. Grind the peanuts in a food processor. Depending on your personal preference, you can have them ground smooth and real fine or you can have them coarsely pulsed leaving a little nutty texture in it. 2. Mix the sugar, ground peanuts, flour and salt in a mixing bowl. Stir until well combined. 3. Drizzle in about 2/3 of the cooking oil and knead together the content using hand. When they have started to come together, drizzle in more oil (a little at a time). 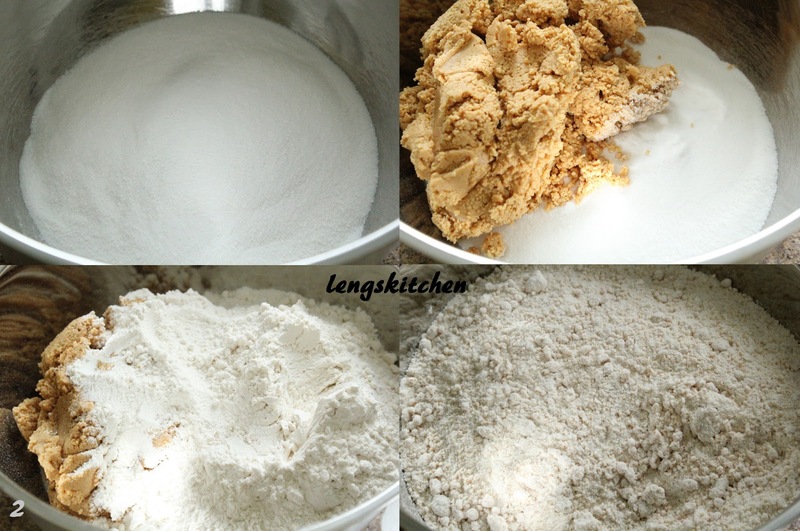 Keep the kneading going until the mixture forms a dough that does not stick to fingers when touched. Test by picking up a small amount of the dough and try shaping it into a ball. If it doesn't crumble as it gets shaped, the dough is ready. Add in a little more oil and knead for a while more otherwise. 4. Get the rolling started! Roll the dough into marble-sized balls. And there goes again my OCD kicking in. Working in the manner of a production line, I have them weighed at 10g each in batches before rolling them away. Arrange them on a baking sheet lined with the parchment paper. Be sure to leave a little space in between them. 5. 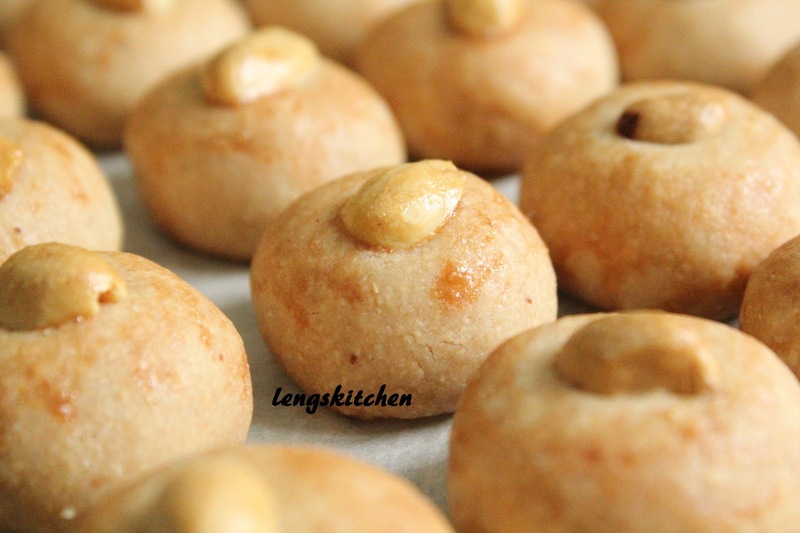 Lightly press in one half of a peanut right in the center of each piece of shaped dough. 6. Using a silicone brush, glaze each of them with the beaten egg, neat and thorough. Too much and the overflowing egg wash will end up getting the cookie stuck to the baking sheet making its removal difficult; too little and they just won't look as pretty when they are out of the oven later. 7. Bake in the preheated oven at 350°F for about 12 minutes, until they turn golden brown. 8. Let cool completely before storing them away in air-tight containers. What type of sugar u used? Castor sugar or icing sugar? Castor sugar or granulated sugar - you can use either one, just not the icing sugar. Hope it turns out fine! hello can I use sunflower oil or olive oil ? That look so delicious and cute! I like to know if i could replaced the oil for butter. You have tried once? I'm not one of those crazy butter womans, but I think that the butter will increase the flavor, that is quite simple. You know the measures for replace the oil for the butter? 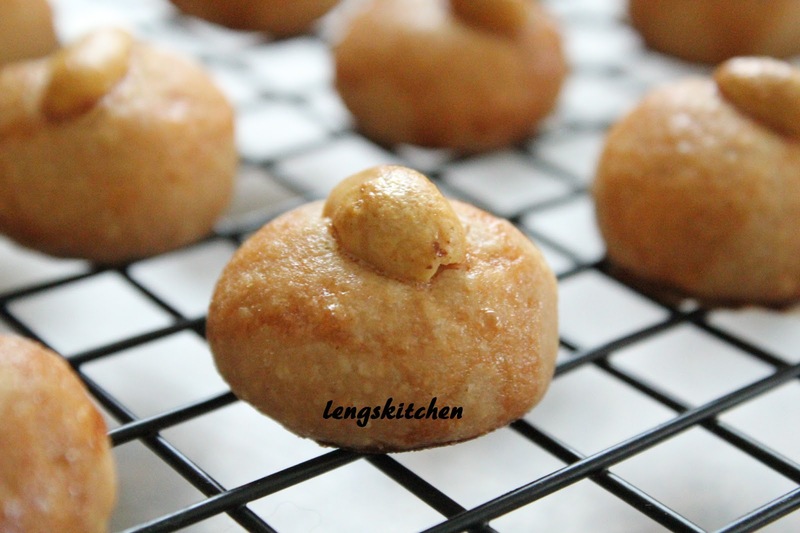 Hi, my peanut cookies cracked a lot. My temperature setting problem or other issue that I overlooked ? Hi onncheng, I can't tell for sure. I was thinking that it could be the over kneading and some other reasons other than the temperature. I would suggest cutting down on the kneading time. Also, you may want to substitute the sugar with finer sugar (Eg. caster sugar with maybe about 10% reduction in amount) because finer sugar makes smoother cookies in general. Hope it helps! I used caster sugar so they are perfect. Cracked cookies- I suspect you put too much flour. Can it be replaced with peanut butter instead? Can I replace to brown sugar?